Over 150 pieces of fitness training equipment including pro-rubber dumbbells, free-motion cable machines, heavy punching bags, suspension training systems, battle ropes, training sleds, medicine balls, kettle bells, powerlifting platforms, climbing ropes, plyoboxes, squat cages, bumper plates, gigantic tires, incline/flat/decline benches, pull-up monkey bars, a full line of cardio equipment and much more. ​There is a separate training room for females and members aged 55+ with cardio equipment, machines and fitness accessories. 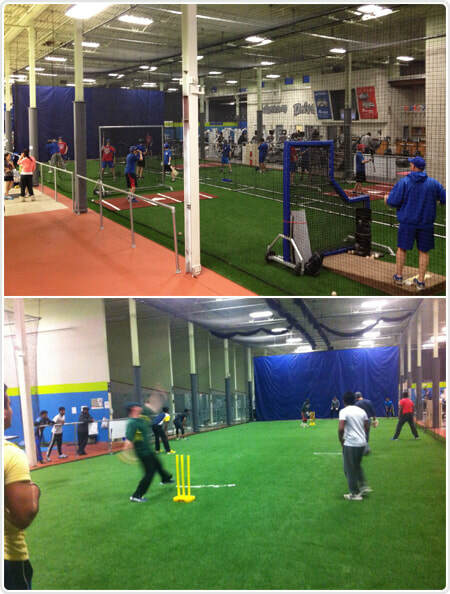 ​Three indoor turf fields that host baseball, soccer, cricket, across as well as numerous dryland team training sessions for pre-season, in-season and post-season conditioning. Multiple different booking options are available including pitching machines, team training, birthday parties and private training with professional coaching using pitching mounds, hitting tees and much more.